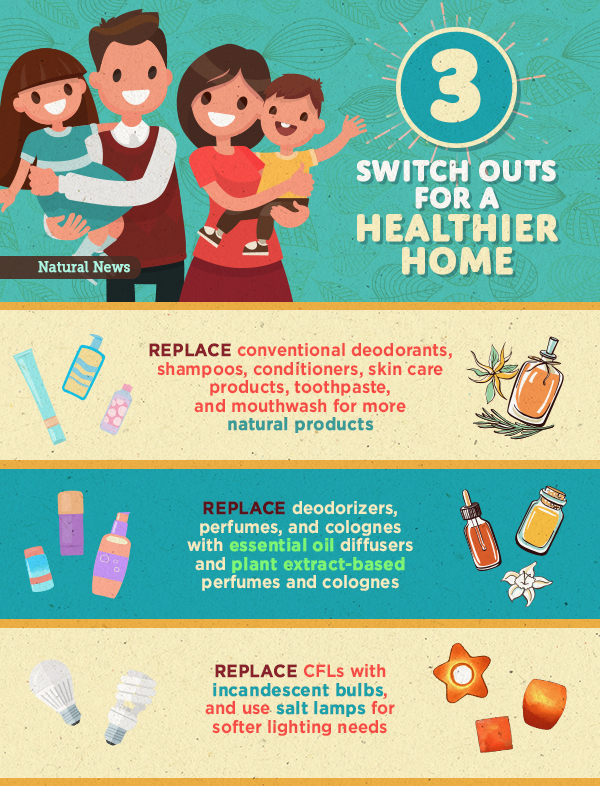 3 healthy “switch-outs” of toxic household products that can help protect the health of you and your family - blogPEI | Prince Edward Island - Breaking News. (Natural News) When starting a journey to better health, it can be difficult to get everyone on board the new health train. After all, change can be scary and different, and upgrading habits can seem like a daunting task with all the other day-to-day challenges that life can present. If this is you and your family, take heart. Not everything has to happen at once, and you can begin to make some easy upgrades and infusions into your home that require no new habits to be generated. Then, once these changes begin to be appreciated, you can move along to the other upgrades until you’ve overhauled the entire house. The point is, start with something really easy, and move on from there. These 3 easy switch-outs will help you get the ball rolling. One of the first impactful switch-outs you can make is your toiletries. This means choosing better deodorants, shampoos, conditioners, skin care products, toothpaste, and mouthwash. Deodorant is likely the most important switch, due to most deodorants containing toxins like aluminum compounds, triclosan, propylene glycol, steareth-N, and more. These chemicals can be absorbed directly into the body and cause many health concerns, including lymphatic problems. The good news is there are many natural deodorants that work, and you don’t need to change any habits on your part. Simply apply the deodorant as usual, and enjoy the freshness and toxin free application. The same thing could be said for skincare, with parabens, sodium lauryl sulfate, and synthetic fragrances leading the way in increasing your toxic body burden. Again, the great news is that there are exceptional skin care products available that are all-natural, that work even better than those highly marketed (and toxic) skincare lines. What you put in your mouth is another major concern, as any toxins can be easily swallowed or absorbed by the delicate tissues inside the mouth. Typical toothpastes can contain fluoride and other toxic ingredients, while mouthwashes contain alcohol, artificial dyes, parabens, tricoslan, and more. Finally, shampoos and conditioners also contain many of these toxins like parabens and sodium lauryl sulfate, which you don’t want to fool with since hair washing is typically a daily activity. The good news is all these items can be easily switched out, and no one is likely to complain because their habits are not really affected. Even better, you can get a healthier deodorant, better skincare, natural mouth sprays and toothpastes, and high quality shampoos and conditioners in the Health Ranger’s Black Friday Sale. It’s a perfect time to make a full sweep, with the generous discounts. Shop part 4 of the Health Ranger’s Black Friday Super Sale for deals on bathroom essentials for up to 39% off here, before it ends on November 24th at 11:59 pm CST. Let’s face it, no one likes to smell stink in the house, but when you have a family, pets, or both, there’s bound to be some off-colored scents roaming through the household. In the past, most people would deal with these scents with highly toxic room deodorizers like Lysol, Glade plug-ins, or the like. The only thing these products ever accomplished was making everyone nauseous or compromising their lung and liver health. The same goes for many perfumes and colognes on the market — they’ve become so synthetic and so many different allergies have developed that many scent-free workplaces popped up to offset the carnage of that liberal dosing of said perfumes. Here’s what’s really cool — you can easily make your own room deodorizers and perfumes (even colognes) with natural essential oils. Not only do they destroy many pathogenic microbes and naturally scent the air, they can positively affect your mood and have many other therapeutic purposes. Simply get your favorite oils and a diffuser, and you have turned your home into a pleasant smelling abode. Get those amazing Christmas smells by using sweet orange essential oil, clove bud, cinnamon, or a combination of all the above. If you still want to use perfume or cologne, many essential oils can do the job. Simply choose your essential oil, add 20-30 drops to a small bottle with a mister, and spray liberally first thing in the morning or at night to uplift your senses and leave you smelling wonderful. Citrus and lavender work nicely for this instance, as well as clove bud for a more manly scent. Everyone will praise you for making this switch out, and not a single habit needs to be changed. Just diffuse or spray, and let the aroma and therapeutic benefits take care of the rest. Take advantage of part 4 of the Health Ranger’s Black Friday Super Sale by getting your favorite essential oils for up to 51% off here, before it ends on November 24th at 11:59 pm CST. Not too long ago, incandescent light bulbs were being phased out in favor of more environmentally and energy friendly compact fluorescent (CFL) bulbs. This was considered a move in the right direction until it became well known that these bulbs need to be taken to special facilities for recycling or when they break because CFL bulbs contain mercury, a toxic element that has many harmful effects on the nervous, digestive, respiratory, urinary, and immune systems. In other words, don’t use them in any areas you plan on spending any reasonable amount of time. Fortunately, there are still some incandescent light bulbs on the market, and it would be a wise choice to pick some up due to their more human friendly nature. I’m guessing that no one will even really notice, other than they may feel a whole lot better. Another nice soft lighting solution for quiet evenings and in the bedrooms is salt lamps. These negative ion emitting solutions help reduce the concentration of EMFs and bio-toxins in the air by attracting moisture (due to the hygroscopic nature of salt) and creating an evaporation effect due to the heat produced by the salt block. This reduces the amount of positive ions in the room which in turns increases the amount of negative ions present, due to the surface of the lamp neutralizing their charge. Very few will complain about switching off the lights in favor of a salt lamp, and their cozy glow can be downright mesmerizing. These lamps make an excellent upgrade to any night lights or regular lights left on overnight, as they create a more pure environment, and cast enough light to soothe the little ones and help you keep from bumping into the dresser in the middle of the night. With many inferior salt lamps on the market due to their popularity, it’s good to have authentic ones so you can enjoy the many benefits. Don’t forget to check out part 4 of the Health Ranger Black Friday Super Sale, where you can get many shapes and sizes of salt lamps for up to 40% off here, before it ends on November 24th at 11:59 pm CST. If you need a place to start, these are some easy ways to make your home a healthier place to live, without the belly-aching that can come with more habit-altering changes. Then once everyone buys into the new program, you can hit them up for even more changes with less resistance. Even better, when you get these items and other things like non-toxic cleaner during the Health Ranger’s Black Friday Super Sale, you don’t have to listen to anyone complain due to all the serious money you saved if you had to buy them at regular price. The Health Ranger’s Black Friday Super Sale Part 4 ends on November 24th at 11:59 pm CST, so don’t hesitate, or your savings will evaporate, for at least another year.